It’s hard to get excited about fishing anything other than the North Platte from now until June. The N. Platte is the real deal and nothing in the lower 48 touches it. April & May are almost completely booked and cabin fever is really starting to set in! For those reasons, we have decided to add another month (March) to our Spring trip on the North Platte in Central Wyoming. Call 720-851-4665 for Booking & Reservations. Find out more about lodging & North Platte Spring fly Fishing! For those that have seen April and May you know it’s great, but March is when some of the largest fish seam to be caught year after year on all three tailwater sections we fish (Reef, Mile, Fremont). Did we mention you can pretty much count on having the river to yourself?!?! During most of the year we prefer to float the N. Platte. However, when flows are still under 500 CFS it really makes more sense to be on foot in our opinion. You will catch bigger fish wading in March than floating (trust us). 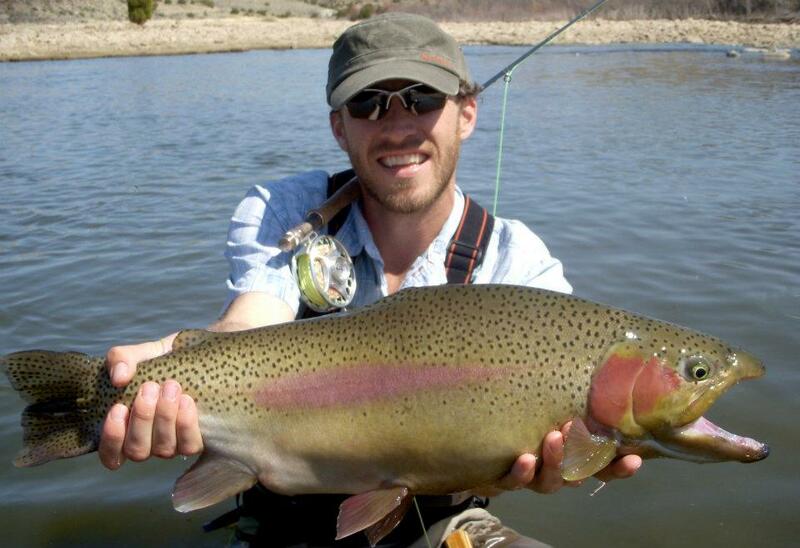 This is a great chance to learn how to spey cast, and swing flies for big N. Platte rainbows! Buy Any Spey Rod or Switch Rod Setup and Get a free Half Day Spey Trip! Learn more about Swinging flies for trout on the North Platte! BUY TWO GET ONE 1/2 OFF MARCH SPECIAL! If you are booked for two or more days in April or May, you are eligible for a $225 full day float trip in March! March Specials include Rods, Reels, Line & Wader boot Rentals. Soft Drinks & Snack. We do have possible options for free lodging so if a hotel room is a deal breaker, let us know and we can work something out. We do not provide lunch or flies on March Specials. Pack a lunch and stop by the shop for info on what flies to bring! A WY fishing license must also be purchased. A standard gratuity is 20% of normal (not discounted) trip pricing.